– In general, males are taller and heavier than females. The Shetland Sheepdog originated in the Shetland Islands off the northeast coast of Scotland and was bred as a working dog, primarily to herd and protect the livestock. The Shetland Sheepdog was once called the “Toonie”, taken from the word “tun” which is the Norwegian word for farm. It is believed that the Shetland Sheepdog and the larger herding Collie have a common ancestor, a herding dog bred in the British Highlands, believed to be similar to today’s Border Collie. The dogs that stayed on the Scottish mainland eventually developed into the Rough Collie and those that were taken to the Shetland Isles were downsized to meet the needs of the island and developed into the Shetland Sheepdog. Today, the Shetland Sheepdog has the same relationship in size and appearance to the Rough Collies as the Shetland Pony has to some larger breeds of horses. There are, however, other differences between the breeds. The Kennel Club (UK) recognized the breed in 1909 as the Shetland Collie and, in 1914, the breed became a completely separate breed known as the Shetland Sheepdog. The Sheltie is extremely loyal, affectionate and responsive with a very strong desire to please, making him a wonderful companion. He is generally devoted to all family members, including children and other dogs. With his high intelligence, the Sheltie has become one of the leading breeds for obedience competition and he also excels in agility, herding and tracking. While the Sheltie is adaptable to different living environments, he is an active, working breed and needs regular, daily exercise. The Sheltie may be reserved toward strangers and is very protective of his family, making him a good watch dog who will alert to any intrusion with enthusiastic barking. Shyness, timidity, or nervousness, however, are not characteristic of the breed. The Shetland Sheepdog can be a barker. However, the amount of barking varies with the individual as well as with the number of dogs. Barking is often learned from other dogs but, with persistence, this can be taught out of the dog. In appearance, the Sheltie is a small, rough-coated, long haired dog. He is alert, agile and sturdy with no parts appearing out of proportion. Dogs are visibly masculine while females are more feminine. The Sheltie has a double coat, consisting of a long, straight and harsh outer coat and a short, furry and very dense undercoat. He has an abundant mane and frill which is particularly impressive in males. 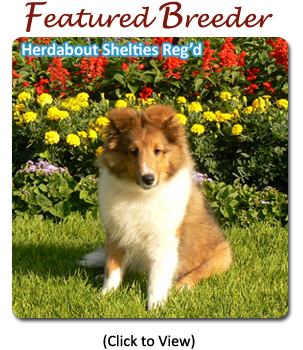 Shelties come in a wide variety of coat colours stemming from either sable or black. Sable colour ranges from golden through red, to deep mahogany with an overlay of black. The most common coat colour is the Mahogany Sable. Generally, pure sable coloured dogs are lighter in colour, while the black-factored dogs are heavily shaded with black. The tri-colour dog is black with tan points on the eyes, cheeks, and usually on the legs. Tri-colours also have varying amounts of white markings on the face, collar, legs and tail tip. The bi-black Sheltie is black with white markings. The blue merle Sheltie can range from silver to steel-blue with varying amounts of black and tan patches throughout. Blue merles also have the tan markings on the face and legs. Like all breeds, the Shetland Sheepdog is susceptible to some health problems, including: Progressive Retinal Atrophy (PRA), Central PRA, Collie Eye Anomaly (also known as Sheltie Eye Syndrome), Corneal Dystrophy, Hip Dysplasia, Thyroid problems, and von Willebrand’s Disease. ASSA Health Research — Functions as a public resource and clearing house for information related to health concerns as they pertain to the purebred Shetland Sheepdog.